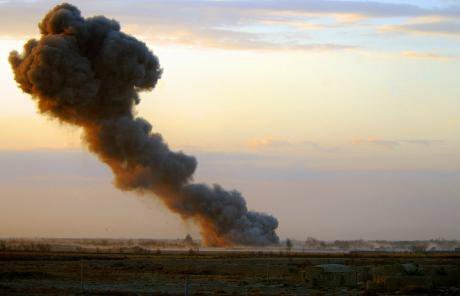 Mushroom cloud from UK Air Support Bombing, Afghanistan. Photo: POA/Sean Clee. Last week, British Home Secretary Amber Rudd announced the publication of the government’s first Annual Report on its National Security Strategy and Strategic Defence and Security Review (SDSR 2015). Given the current international climate, this is an important exercise. The report is potentially a significant opportunity for the government to update parliament on the strengths and weaknesses of the UK’s responses to the major security challenges of the day, to justify its expenditure and to indicate what adjustments it is making to improve effectiveness. Unsurprisingly, for a government exercise in marking its own homework, the assessment is overwhelmingly positive. Theresa May’s foreword describes “good progress in each area” and asserts that “time and again, it is British leadership – British hard and soft power – that is at the forefront of the world’s response to the greatest challenges of our time.” The report then lists actions taken in respect of each of three overarching objectives; it details all 89 of the principal commitments outlined in SDSR 2015, of which 12 have been completed and 38 “set in train”. This all sounds quite encouraging, until you look more closely at what is missing. First, the report operates in a strategic grey zone. The SDSR 2015 gave no definition of the “security” it is setting out to achieve. It failed to identify the principles by which this security would be built and sustained, and provided no indicators or benchmarks against which progress would be measured. Yes, it listed a set of objectives and actions, but there was no explanation of the intended cumulative outcome of all this activity and expenditure. This weakness has been picked up by the Joint Committee on the National Security Strategy (JCNSS), the main parliamentary body scrutinising the implementation of the strategy. In its first report earlier this year, the JCNSS commented that “the primary goal of the NSS and SDSR process is to set out (a) what the UK wants to achieve; (b) how it intends to achieve it; and (c) what capabilities are required. The NSS and SDSR 2015 does not achieve that presentational goal”. This is more than just a small PR problem. It is a serious obstacle to assessing the effectiveness of a major part of public expenditure on an issue of critical national importance. And it matters all the more because the government’s record in this area is decidedly mixed; many actions undertaken in the name of ‘national security’ have indeed been quite disastrous. The Royal United Services Institute has judged the UK’s recent military interventions in Afghanistan, Iraq and Libya as “strategic failures” – all of which continue to generate huge insecurity both for people in those countries and, to a far lesser extent, for people living in the UK. 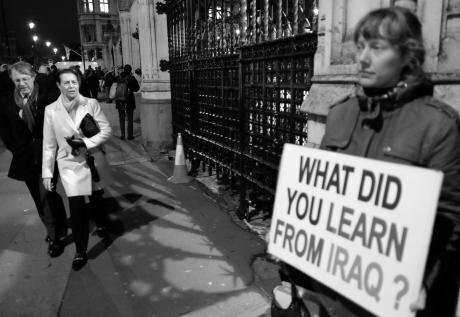 The Chilcot Report, published in July this year, described the UK’s actions in Iraq as “an intervention which went badly wrong, and which has consequences to this day”. Last week's annual report on SDSR 2015 acknowledges Chilcot’s findings almost as an aside, saying only that the lessons had mostly already been anticipated and incorporated. This assertion is in marked contrast to other assessments of the government’s ability to learn lessons from past foreign policy failures. As recently as last month, the Foreign Affairs Committee chastised the government for, in its view, unwillingness to learn the lessons of the 2011 intervention in Libya, which it described as contributing to “the collapse of the state, failure of stabilisation and the facilitation of Islamist extremism”. Questions about the outcomes of the UK’s national security interventions both here and elsewhere in the world need to keep being asked. The second big omission in both the SDSR 2015 and the annual report is any serious effort to address the long-term drivers of insecurity. UK policy quite reasonably seeks to respond to what it perceives to be some of the immediate security challenges facing the country – a resurgent Russia, the threat of terrorism, and global instability. While these risks are real, they cannot be meaningfully addressed in isolation from the profound security challenges arising from how we organise our societies. Despite growing global awareness of the urgent risks posed by climate change, the issue is marginalised in the original government strategy and receives only two fleeting mentions in the annual report. The same is also true of economic inequalities stemming from the neoliberal model, the polarising effects of which Mark Carney, the Governor of the Bank of England, warned about just this week. To make real progress on tackling insecurity, there needs to be far greater commitment to addressing its causes, and not just its symptoms. The third major gap in the report is the yawning chasm that sometimes appears between the UK’s rhetorical commitment to international norms and its actual practice. The report describes the UK as a “leading supporter of the international rules-based system”, and specifically notes that the government continues to lobby for and encourage ratification of the international Arms Trade Treaty. And while accusing other powerful states and non-state actors of “ignoring international norms that they believe run contrary to their interests”, the report fails to acknowledge concerns over the UK’s continued arms exports to Saudi Arabia, despite warnings from the UN that the Gulf Kingdom could be committing international crimes in the course of its bombing campaign in Yemen. But there are also omissions in relation to security issues that are far closer to home. Despite its 38 pages, and its repeated references to the threats posed by terrorism, the annual report makes not a single mention of the security situation in Northern Ireland. It makes no reference to the statistics quoted in the recent publication by the Independent Reviewer of Terrorism Legislation, which describes three “security-related deaths” in the year to March 2016, as well as 36 shooting incidents and 52 bombing incidents. Paramilitaries are also reported to be responsible for more than 400 incidents per year of people being forced out of their homes. While these figures are of a significantly lesser order of magnitude than during the Troubles, they are statistics that simply would not be tolerated in Great Britain. With the UK spending more than £35 billion per year on defence, and with a commitment to increase counter-terrorism expenditure from £11.7 billion over five years to £15.1 billion over the same period, it seems reasonable to expect a proper reckoning of the impacts of that expenditure for the common security of people throughout the UK and beyond. But the annual report on UK national security policy is beset by the flaws of the strategy published last year. The government needs to be willing to define security and articulate the intended outcomes of its interventions. It should consider a much greater emphasis on addressing the long-term drivers of insecurity, rather than focusing only on short-term symptoms. It needs to live up to its rhetoric, consistently upholding international standards and recognising that it cannot build security for people in the UK at the expense of the security of people in other parts of the world. Only then are we likely to be able to see, and measure, meaningful progress.